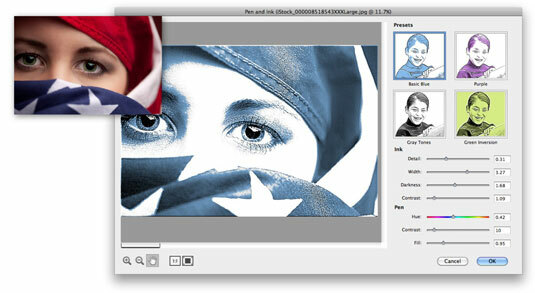 The Pen & Ink filter in Photoshop Elements 11, similar to the Graphic Novel filter, gives your photo more of an illustrative look, as if created with a pen and colored or black ink. In either Expert or Quick mode, choose Filter→Sketch→Pen & Ink. Detail: A higher value creates finer, crisper edges. Width: A higher value creates thicker, goopier strokes, while a lower value creates crisper strokes. Darkness: A higher value creates more areas of darkness. Contrast: The higher the value, the more contrast the image has and the more dark ink strokes are applied . Hue: Adjust the slider to select your desired color along the color ramp. Contrast: A higher value adds more contrast, darkness, and colored areas. Fill: Fills the image with more areas of color and less white. Hand tool: Moves you around the image window when you’re zoomed in.